Let’s face it; you’re jonesing for a drink already aren’t you? So many hours left of the day, so many days left of the week... 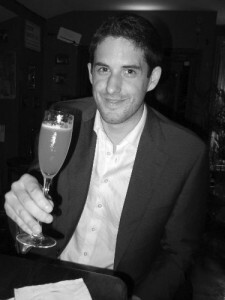 But to save you hitting the same old places with the same old faces on your precious non-school nights, allow us to introduce The London Cocktail Society, who specialise in furtling about in London’s darkened, booze-riddled corners to get an intimate view of some of the best quaffing joints in town. Founded by three keen bloggers – Gin Monkey, the London Cocktail Guide and London’s self-professed Cocktail Geek - this group of mixology aficionados offers you the opportunity to meet new people and have an exclusive peek behind the scenes of the cocktail industry, whether you’re new to town and in need of a good, stiff drink, or are getting a bit jaded with all the talk of been-there-done-that. And unlike many such tours and events, these are free, leaving you more cash to spend on pickling your liver. 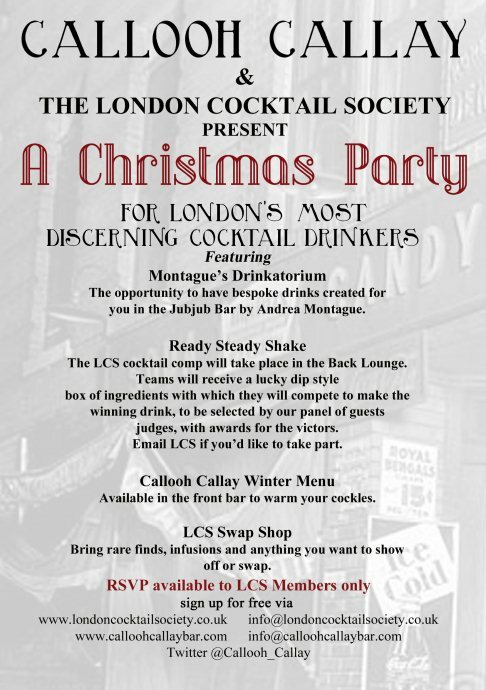 This time next week you could be prepping for their Christmas Cocktail party at Calloh Callay in Shoreditch. On hand to fulfil your Christmas wishes will be last week’s Jub Jub bartender, Andrea Montague, who will quiz you for your ultimate cocktail cabinet covetables in order to mix you your own, bespoke concoction. Downstairs will see a unique Ready, Steady, Shake! competition, where teams will battle for prizes by going head to head to create the most exciting cocktail from a selection of random ingredients. The front bar, meanwhile, will be given over to sitting back, sampling the new winter menu, and trading those odd-ball spirits you’ve got tucked away, be it homemade or a rare treasure. And what do you have to do to bag a ticket to this extravaganza? Simply dazzle the Monkey, the Guide and the Geek with your charm. It’s as easy as falling off a bar stool.